This article will guide you about how you can use the Accountant’s Copy in QuickBooks Desktop. This ultimate feature in QuickBooks Desktop makes it possible for accountants and clients to work on a company file simultaneously. QuickBooks users can seamlessly transfer the copy between accountants and clients. There is no need to send bulky files via email. 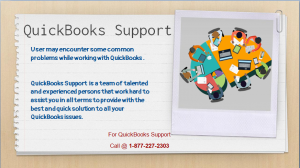 The QuickBooks Customer Support team will help you understand the working of an Accountant’s Copy works as well as explains you about what you can and can’t do in an Accountant’s Copy. The accountant’s copy feature uses Intuit servers to transfer files between accountants and clients. You do not require saving the copy on your computer or local drive. client to continue to work on current items in the working file (.QBW). 2.The Accountant’s Copy is saved as an export file (.QBX) to the server. 3.The system sends an email to the accountant which contains a download link to export the file. 4.Using the download link in the email the accountant can access and opens the file, and creating a working file (.QBA), to make changes in it. 5. Once the change has been made by the accountant, the person has to create an import file (.QBY), which is saved to the Intuit server to be used by the client on the other side. 6. Using the import file the client can make changes to the company file which the accountant has made. The Dividing Date is used to define the fiscal period in the accountant’s copy so that the accountant can work on it accordingly. The dividing date restricts the modification on transactions by the accountant. The transactions that fall on or before the dividing date can only be modified. What a client can and cannot do while changes are pending? A client can work in .QBW file till the time an accountant is making changes in the Accountant’s Copy sent. A client is allowed to make changes to transactions in the current period, after the dividing date. • Changes to existing accounts cannot be made. • Assisted Payroll Data or Direct Deposits cannot be sent. You can reconcile your accounts with a pending Accountant’s Copy. But in some cases, your reconciliation may be rolled back. To avoid such cases consult your accountant whether they plan to reconcile the Accountant’s Copy before you reconcile your accounts in your working file. Accountant’s Copy allows reconciliation only up to 800 transactions. For transactions more than 800, the reconciliation won’t import into the client file. QuickBooks Desktop itself restricts editing information or transactions on accountant’s copy received from client side that may conflict with client’s work. Also, the client is restricted to edit the information before the Dividing Date so as no conflict occurs with the changes made by you. • Non-highlighted background: the information in non-highlighted fields can be changed, if necessary, but the changes will not be included in the change file which will be sent to the client. The changes you can make is specifically limited. Listed below are the changes which you can and cannot make in your accountant’s copy. For more information or assistance on the accountant’s copy, you can directly reach QuickBooks Support team @ 1 (877) 227 2303.